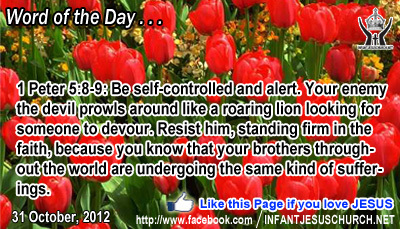 1 Peter 5:8-9: Be self-controlled and alert. Your enemy the devil prowls around like a roaring lion looking for someone to devour. Resist him, standing firm in the faith, because you know that your brothers throughout the world are undergoing the same kind of sufferings. Heavenly Father, Thank you for sending Jesus to break Satan's monopoly over us. Through the Savior's death you have assured us that this will not be the end of our relationship, but the beginning of life with you. Today, however, we ask that you help us particularly resist Satan's power over our life in the following ways: in the name of Infant Jesus we pray. Amen. Jesus opens the way for us to go into God's kingdom through the cross where he has laid down his life as an agreement of sacrifice for our sins. If we want to enter and stay citizens of God's kingdom, then we have to go after Jesus in the way of the cross. The word struggle can also be translated anguish. To enter the kingdom of God one must effort against the forces of temptation to sin and whatever would obstruct us from doing the will of God. The good news is that we do not fight alone. God is with us and his grace is enough. As we struggle side by side for the faith of the gospel Jesus promises us of complete victory. Loving Infant Jesus, help us always trust in your saving grace, especially when we are tempted and put to the test. Help us to be authentic to you and give us the courage and power to resist temptation, particularly the temptation to negotiation or to be unresponsive to your word.